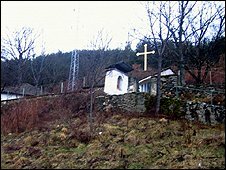 Up 240 steps, behind a padlocked wooden door, is a shrine holy to both Christian and Muslim believers. It is not well known. Wary of flocks of tourists, the people in Makedonski Brod, in south-western Macedonia, have kept its existence a well-guarded secret for years. The aged building, marked only by a cross from outside, is decorated within by Christian icons, and portraits of both Jesus Christ and Muslim saints. A stone - said to be from the tomb of a saint of the Bektashi order of Islam, sits right in the middle of the room. The Bektashi Order is a branch of Sufi Islam which originated in Turkey and spread to parts of the Ottoman empire, including the Balkans. For its adherents this building is their place of prayer - a "turbe". To Christians it is the Church of Saint Nikola. But they have shared the space happily for years. It is a remarkable feature in a region that has so recently been torn along ethnic and religious lines. Baba Ejup Rakipi, the local Bektashi leader, tells how, once a year, Christians and Muslims come together here on the day of Saint George known as "Gjurgjovden". On that day, after prayers, he says, believers sit around the same "table of love". They drink from the same glasses and eat with the same forks. "There are souls who neither doubt, nor feel disgust towards other souls, because we are God's creatures and cannot be divided," he says. The shrine in Makedonski Brod was first built as a church in the 14th Century, but was destroyed later during the Ottoman invasion, historians in Macedonia's capital, Skopje say. But the legend told in the area has it that the church was rebuilt as a sacred place in the 18th Century by a Muslim bey, in an effort to remove the curse from the house he was trying to build, that was always collapsing. 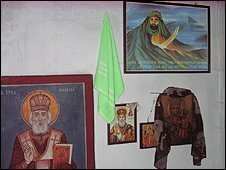 In the shrine of today, the Orthodox priest, Marko, says he often prays for the Muslim worshippers and "sometimes miracles happen". He tells the tale of a mute Muslim boy who had started to speak upon hearing an Orthodox prayer read for him. "Unfortunately, I do not have any scientific evidence to back this," he adds. As for sharing the space with believers of another faith, the priest has no problem. "Our origin is from the same creator, therefore we are all the same in front of God no matter what religion we belong to - Muslim, Orthodox or Roman Catholic. We are all the same and the God's mercy is equal for all," he says. Historians in Macedonia's capital, Skopje, say that the shrine at Makedonski Brod, although not known to many, it is not the only one in the country. Ethnologist Elizabeta Koneska has studied the phenomenon for years. She says such places of worship are common in small countries like Macedonia. "For centuries, people who lived together, also prayed in common temples," she says. "Although the ritual was observed discretely, people respected it and tolerated each-other".